This is your stereotypical Kilburn Irish boozer, it ticks every box. The punters are mainly a friendly bunch, standing round the bar and waxing lyrically about what you would expect older working class men to talk about. 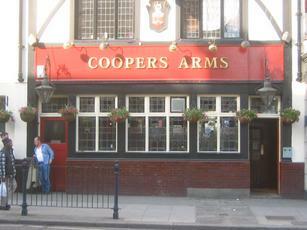 There's a nice atmosphere to Coopers, doesn't feel like you're on the High Road at all. Certainly the place I make a beeline for when in Kilburn. On a recent tour of the High Rd this was the only Pub I felt anyway comfortable in. As already mentioned here it is an honest, no frills Irish local. Friendly locals and Bar staff. My Girlfriend overheard some locals comment on how shocking it was that I left her on her own whilst I went to the toilet, which is quite quaint really!! This is a great, friendly pub, in the heart of Kilburn. A spacious beer garden and good prices. What else can you ask for? Looking forward to St Patricks day as it is always a good craic there! A good honest pub selling good honest beer. No more, no less. Recently had a mini-crawl up the High rd for old times sake and this was the only pub in which it was a pleasure to drink. As remembered, always busy with friendly staff and locals.